(TORONTO, ON – SEPTEMBER 29, 2016) You learn a lot in 50 years – and as the Toyota Corolla celebrates five decades – during which it has become the world’s best-selling vehicle – the 2017 Corolla is even better, with enhanced body styling, an upgraded interior, added advanced safety features, and even more features as standard. The adoption of the Toyota Safety Sense P (TSS-P) package on all models. This includes the Pre-Collision System with Pedestrian Detection, Lane Departure Alert with Steering Assist, Dynamic Radar Cruise Control, and Automatic High Beams. Redesigned front bumpers, new headlamp and tail lamp design and new wheel designs. New instrument panel and interior trim designs. More model-specific enhancements to standard equipment (detailed below). 2017 Toyota Corolla CE models now feature a 3.5” Multi-information Display, 6.1” Display Audio system and automatic bi-LED headlamps as standard equipment. The CVTi-S also replaces the four-speed automatic transmission used on older models. 2017 Toyota Corolla LE models now feature automatic climate control, a 3.5” Multi-information Display, bi-LED headlamps, and a windshield wiper de-icer system as standard. An available upgrade package (starting MSRP: $21,990) adds power slide/tilt moon roof, 16” alloy wheels, and a leather wrapped steering wheel. For 2017, this package is enhanced with the addition of a heated steering wheel. The Corolla SE is updated for 2017 with the addition of automatic climate control, a 4.2” Multi-information Display, multi-LED headlamps, unique bumper with LED daytime running lights, LED reverse lights, and a windshield wiper de-icer system. An available upgrade package (starting MSRP: $21,805 with the manual transmission and $22,790 with the CVTi-S) adds 17” alloy wheels, rear discs brakes, and a power tilt/slide moon roof. For 2017, this package is enhanced with the addition of a heated steering wheel. New for 2017, the Corolla XSE features 17” alloy wheels, rear discs brakes, a power tilt/slide moon roof, 7” navigation display, integrated Sirius XM Satellite Radio, a 8-way power adjustable driver’s seat, Softex leather seat surfaces, the smart key system with push button start, auto-dimming rear view mirror with HomeLink garage door opener and compass, tire pressure monitoring system and unique XSE badging. The Corolla LE ECO is updated for 2017 with the addition of a 3.5” Multi-information Display and a windshield wiper de-icer system. The Corolla LE ECO features a special 1.8-litre four-cylinder engine (140 hp) with VALVEMATIC technology, boosting performance and fuel efficiency. The 2017 Toyota Corolla looks great and is fun to drive. It’s the perfect vehicle for today’s spirited, urban citizens to proudly call their own. Regardless of transmission, the 1.8L four-cylinder engine delivers a winning combination of confident acceleration and impressive fuel efficiency. The body is sporty and sleek, while the cabin offers comfortable seating for up to five adults, surrounded with premium finishes for a sophisticated look and feel. Safety is always standard on a Toyota, so in addition to the new Toyota Safety Sense P package, every 2017 Corolla is equipped with active and passive safety features, including eight airbags, the Toyota Star Safety System, whiplash injury lessening front seats, and more. 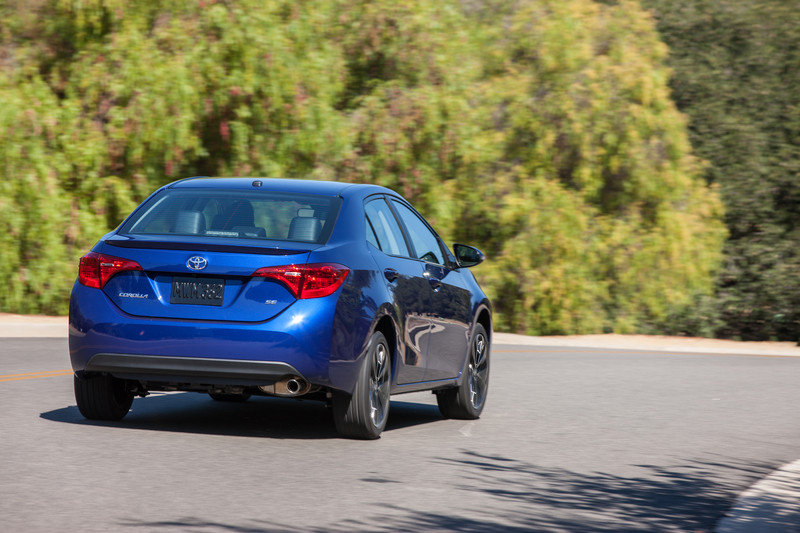 And as North America’s best-selling compact, with a sterling record for durability and reliability, the Corolla gives owners the peace of mind of dependable transportation that enjoys high resale value. For complete and up-to-date details and specifications on the 2017 Toyota Corolla, visit www.toyota.ca/corolla. To learn more about Toyota Safety Sense, visit www.toyota.ca/toyota-safety-sense/en.